I’m not sure where I learned about melonpan, but it was probably on a blog just like this one. I probably stumble on the recipe and just decided to make it one day. 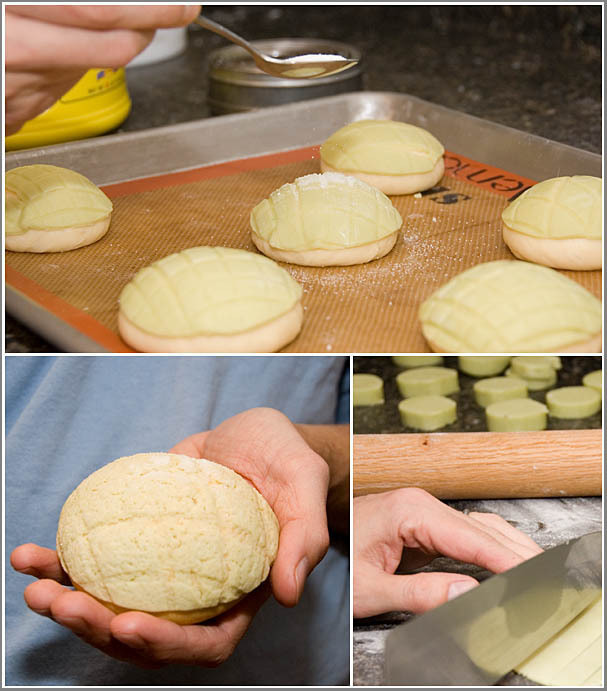 Melonpan is a sweet Japanese bread covered with a crisp cookie crust. The tops are scored into a cross-hatch pattern to simulate the look of melon skin. When cooked, there is a mixture of soft bread texture combined with the crispy, sweet cookie on the top. Oddly, melonpan has no melon in it and is not usually melon flavored at all. Melonpan isn’t all that hard to prepare. If you can manage, you should keep the dough relatively sticky so the dough will stay soft. Keep in mind that this should be a light and fluffy bread, not a tough, dense bread. The cookie crust is a snap and is nothing more than a basic sugar cookie. I like to add a few drops of food coloring to the tops just to add some color. Combine the yeast and the warm water and let sit for five minutes. Combine yeast and water, sugar, and half the flour in the work bowl of a kitchenaid and mix at low speed it until everthing comes together. Add the butter and the egg and start kneading the extra flour into the dough. Keep kneading and adding flour until you have a slightly sticky dough that pulls away from the side of the bowl. 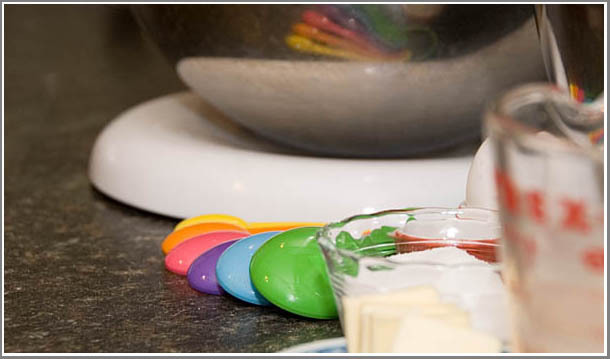 Remove the dough from the bowl and place in a lightly oiled container and cover with plastic wrap. Let rise for 45 minutes at room temperature. While the dough is rising, make the cookie crust. Place the butter and sugar in the kitchenaid fitted with the paddle attachment. Mix at high speed, scraping down the sides, until the butter and sugar are fully combined and turn to a pale yellow color. Incorporate the egg at low speed. Add the flour and the baking powder and mix until just combined. Remove from the bowl, shape into a log, wrap tightly in plastic, and refrigerate until firm. Remove the dough from the bowl and cut into nine equal pieces. Roll each dough piece into a tight ball and set aside. Remove cookie crust from refrigerator and cut into nine equal pieces. Roll each piece into a circle and, with the back of a knife, make a cross-hatch pattern in the dough. Place cookie on top of roll. Repeat eight more times. Sprinkle sugar over the cookie crust on each bun. Bake in 350F oven for 20 minutes or until lightly golden brown. Cool on wire racks. My cooking will save you! There is no milk powder indicated in the recipe. Is there any mistake? KD: You can substitute all purpose flour, it shouldn’t be all that big of a deal. I’ve done it before with good results. Do I have to use bread flour?